Takeaway: These four poses will help you to stretch out your body and find more flexibility, both physically and mentally. Are you strong, but want to be more supple? Fit, but desire increased flexibility? Flexibility, both physical and mental, is one of the many health benefits yoga delivers. It’s a complete practice, one that upgrades us on all levels: body, mind, and spirit. There’s no doubt in my mind that over 20 years as a dedicated yogi has increased not only the flexibility of my body, but also the flexibility of my mind, and my ability to roll with life’s punches. If flexibility is something you’d like to work on, then look no further than the following yoga asanas. Practice these postures daily, and you’ll be more open in no time. To do cat-cow pose, come to all fours. Your wrists should line up with your shoulders and your knees with your hips. This position is also known as tabletop. Now, simply inhale and arch your spine. 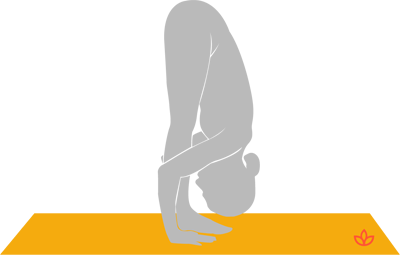 This is the ‘cow’ portion of the pose. On an exhale, round your spine like a cat. Go back and forth, inhaling as you arch and exhaling as you round. Be sure to synchronize your breath with the movement for increased relaxation and flexibility. This is one of the best poses if you want to increase hamstring flexibility, which basically all of us do. We all have tight hamstrings and we need to loosen them to avoid injury. Like cat-cow pose, uttanasana also increases spinal flexibility. Giving the neck a nice, long stretch is yet another benefit of standing forward fold. It’s an all-around great pose---for beginners, intermediate, and advanced practitioners alike. To do standing forward fold, stand with your feet hips-width distance apart. Make sure the outer edges of your feet are parallel to one another. At this point, you’re standing tall in mountain pose, with a long spine and long neck---standing tall and straight. Next, raise your arms above your head to stretch upwards. Then, fold forward at the hips, keeping your back long and straight. Place your hands on blocks, on your ankles, toes, or the floor---wherever feels comfortable. You want to feel a nice stretch without overdoing it. Stay here and breathe deeply, feeling the back, neck, and hamstrings open. Stay in uttanasana for as long as you like. A fun way to come out of the posture is to simply roll slowly up your spine---one vertebrae at a time, until you’re back to where you started in mountain pose. Somatic practices teach us that we hold emotional baggage in our hip region. To let go and let energy flow, we need to loosen up our hips. One of my favorite poses for greater hip flexibility is pigeon pose. Often referred to as the ‘king of hip openers,’ pigeon pose opens the hip flexors and the hip rotators. Cobra pose is a great beginner’s pose for spinal flexibility. It’s the precursor to upward-facing dog, and works wonders if your back is tight---especially the lower back. Cobra pose also strengthens the muscles of the lower back, which will save your back in the long run. To do cobra pose, simply lie on your stomach and place the palms of your hands under your shoulders. Press your palms into the mat and roll into a slight backbend. Using your back muscles, simply breathe deeply for a few cycles of breath. To come out of the pose, gently roll back down to your stomach and then push yourself back into child’s pose. Child’s pose is a great counter pose for cobra or upward facing dog. Take several long, deep breaths in child’s pose until you feel like your spine is more open and flexible than when you started. When it comes down to it, all yoga poses work to increase your flexibility. And the cool thing is, when you become more flexible in your physical body, you also become more flexible in your mental one. As your body opens, so does your mind. There are very few narrow-minded yogis and yoginis walking the planet. So, remember this as you work on your flexibility. Yoga is a body-mind experience, which makes it one of the most fascinating whole body healing modalities on earth!